For your convenience, we offer several secure ways to pay your utility bill. Manage and pay your bill online using MyAccount. This tool, available to all residential and commercial customers, allows you to pay your bill online using a credit or debit card with the Visa, MasterCard or Discover logo, or by transferring money directly from your checking or savings account. Register or login to MyAccount. You can pay by phone using your Visa, MasterCard or Discover. To pay, you will need the last four digits of the primary account holder’s Social Security Number. It is easy to pay any utility bill at a TPU Pay Box using cash, a personal check or a Visa, MasterCard or Discover. Our Pay Boxes are located at select grocery stores throughout Pierce County and at our Administration Building at 3628 S. 35th St. Please note we cannot accept money orders, cashier’s checks, traveler’s checks or foreign checks at Pay Boxes. Some locations are open 24 hours a day, seven days a week, and all locations offer English and Spanish prompts. 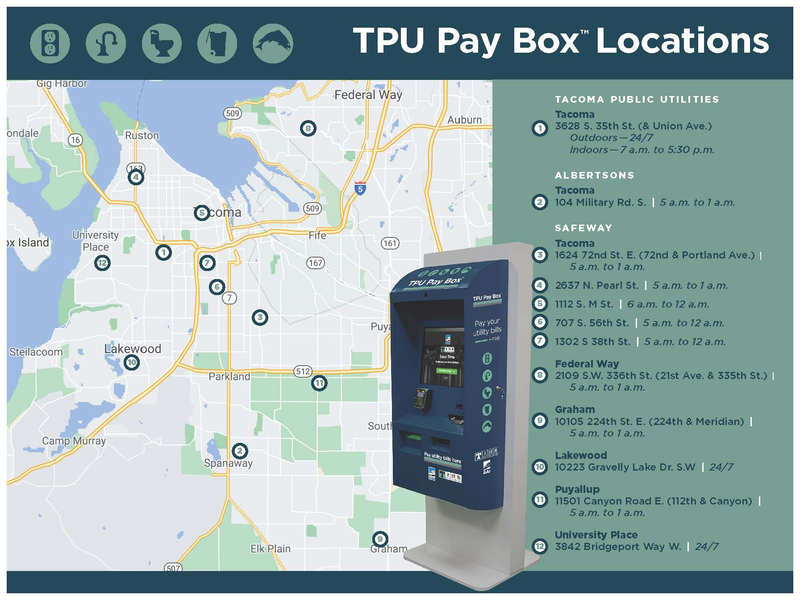 View a map of all Pay Box locations. Payments are accepted at our Customer Services department located in the lobby of the Tacoma Public Utilities Administration Building at 3628 S. 35th St. in Tacoma. Accepted forms of payment include cash, check, cashier’s check, Visa, MasterCard or Discover debit and credit cards and money orders. Payments by check or money order can be placed in one of the drop box locations at our offices at 3628 S. 35th St. in Tacoma. The drive-up box is in the parking lot directly across the street from the main entrance. Walk-up drop boxes are available at the front and west entrances of the building.